Columbia Police Department (CPD) investigators are working to identify two men accused of stealing money from a pizza restaurant last week. 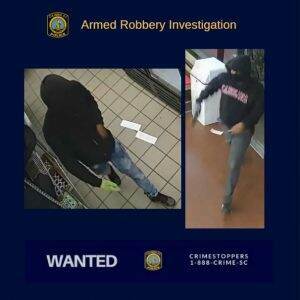 The incident occurred on February 5, 2019 at approximately 11:30 p.m. at 7410 Garners Ferry Road (Dominos Pizza). It’s believed that at least one of the suspects was armed with a handgun. No one was injured during the incident. CPD investigators ask that you review the two surveillance pictures and pay close attention to the suspects’ clothing and shoes.